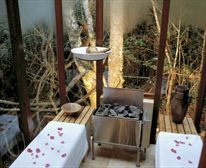 Trogon House & forest spa offers exquisite luxury, suspended in the tree tops of a forest reserve that stretches untamed along the Tsitsikamma mountains and beyond. 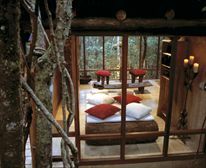 tree tops, the lodges embrace the forest with see-through glass walls and sky-lit roofs, creating a true "nature forest" experience. This secluded hideaway offers two lodges, namely Malabar Lodge and Tomba Lodge. Both lodges are identical and tastefully decorated with exquisite attention to detail; each piece is handpicked: The finest Egyptian linen, silks and crystal combined with exotic antique and African art treasures - pure indulgence for all senses is guaranteed and offered for a guest's absolute enjoyment and pleasure. Added to the existing lodge in February 2008, Tomba Lodge houses the exceptional African artefact collection assembled by the owner over ten years, as well as the luxury décor - antique furniture pieces, crystal, fine Egyptian cotton linen and silks - for which Trogon House is already known. It sleeps up to eight guests in three en-suite bedrooms, including a spacious and luxurious family room with two double beds overlooking the private pool and forest. provided by a renowned therapist and range from salt scrubs and Swedish Massages to Hot Stone and Aromatherapy treatments. 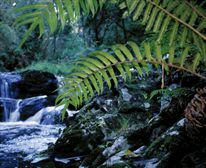 The two lodges are carefully positioned and designed to ensure that exclusivity and privacy are guaranteed at both properties. A walkway will link the two lodges making the entire property ideal for smaller groups or even incentives. Following the latest trend and demand by the discerning VIP traveller for personalised privacy, Trogon House is created for the exclusive use of one party offering accommodation for a maximum of eight guests per lodge. 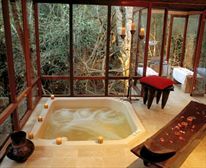 serenity that allows guests to unwind and enjoy luxury in natural surroundings. Indulge your senses with a personalised treatment. This treatment caters also to problematic areas. The techniques used affect the deep layers of muscle dissolving adhesions and built-up waste products. A wonderfully relaxing treatment using Hot Stones and sweeping strokes to melt away any tension. A gentle massage style which ensures a more efficient drainage of lymphfluid and aids in the removal of toxins out of the tissues. An all over body treatment to leave you feeling tingly and fresh all over. Perfect as a pre massage treat. Gentle pressure and meridian stretches leave you feeling relaxed and balanced. Please wear loose clothing. Please note that for cancellations less than 24 hrs in advance, the full rate will be charged. A relaxing and energising massage which stimulates the circulation. A combination of techniques leave you feeling light as air.